Homemade Blueberry Syrup is the perfect addition to your breakfast buffet. 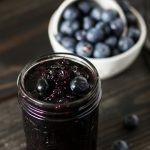 Add this easy homemade blueberry syrup to pancakes, waffles, french toast, or even ice cream! In a sauce pan, over medium low heat, add 1 cup blueberries and 2 tbsp maple syrup. Cook 5 minutes, stirring frequently. Add in the remaining ingredients. Stir to combine and cook for another 5 minutes. Once all the blueberries have started to break down, remove from heat. You can leave as is with chunks, strain out the blueberries, or put syrup in a blender to make more consistent, non-chunky texture. **Nutritional facts are just estimates. Please utilize your own brand nutritional values to double check against our estimates.